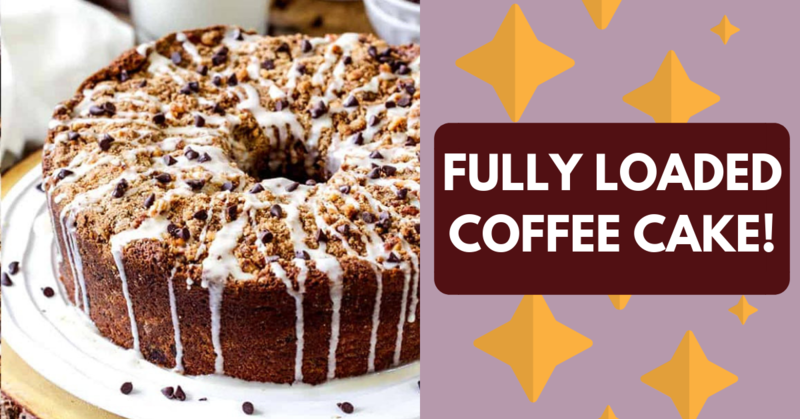 This fully loaded coffee cake has cream cheese stuffing, chocolate chips, and banana bread - try this amazing recipe today! 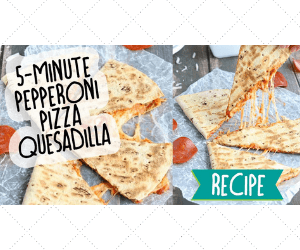 Preheat oven to 350 degrees F and spray all inside surfaces of a 16 cup nonstick tube pan with nonstick cooking spray WITH FLOUR or grease and flour the inside of your pan. Set aside. Cinnamon Walnut Streusel: Add walnuts to your food processor and pulse 3 times. Add flour, brown sugar and cinnamon and pulse a few times to combine. Sprinkle cold butter over top and pulse until the walnuts are chopped and the mixture resembles small pebbles. (You may also combine in a bowl and cut the butter in by hand). Set aside in the refrigerator. Using a stand or hand mixer, beat butter and sugar until fluffy on medium-high speed, about 3 minutes. Add eggs, one at a time, beating just until the yellow disappears after each egg. Mix in vanilla and bananas until just until combined. To your now empty mixing bowl, add 1/4 cup reserved batter, cream cheese, 1 teaspoon vanilla, and 1/4 cup sugar. 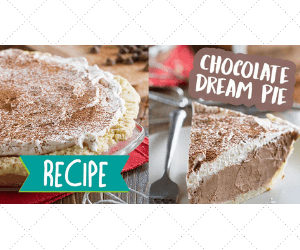 Beat on medium-high speed until smooth and creamy, about 1 minute. Spoon Cream Cheese Filling over batter and gently smooth, but do not touch the sides of the pan. Spread reserved 1 cup batter evenly over filling (it will be very thin). Tap pan on the counter a few times to get rid of any air bubbles then sprinkle evenly with Cinnamon Walnut Streusel. Bake for 55-60 minutes at 350 degrees F or until a toothpick inserted comes out clean (without inserting in cream cheese). Let baked cake cool on wire rack for 1 hour. Gently invert cake onto a baking sheet, remove the pan, and invert back onto cooling rack streusel side up. Let cool to room temperature. When ready to serve, whisk Vanilla Glaze ingredients together in a medium bowl and drizzle over cake. Sprinkle cake with mini chocolate chips.